July 7, 2017. The aim of the event was to get acquainted with a good example of grassland management and find out about significance of livestock impact on grassland maintenance. At the beginning, farmer Gatis Atmats introduced with his family and shortly told how he had started to become a farmer. He started with rabbit and poultry farming, but now he has 185 sheep and 2 beef cattle to improve grassland management. After he told about farm structure and grassland maintenance practices from his experience. This is family business and mostly all season he is working by own. The farming and meet production is certified as organic; meat is sold directly to customers. In future he wants to create meat packing plant to decrease slaughter prices and get more money from 1 sheep. 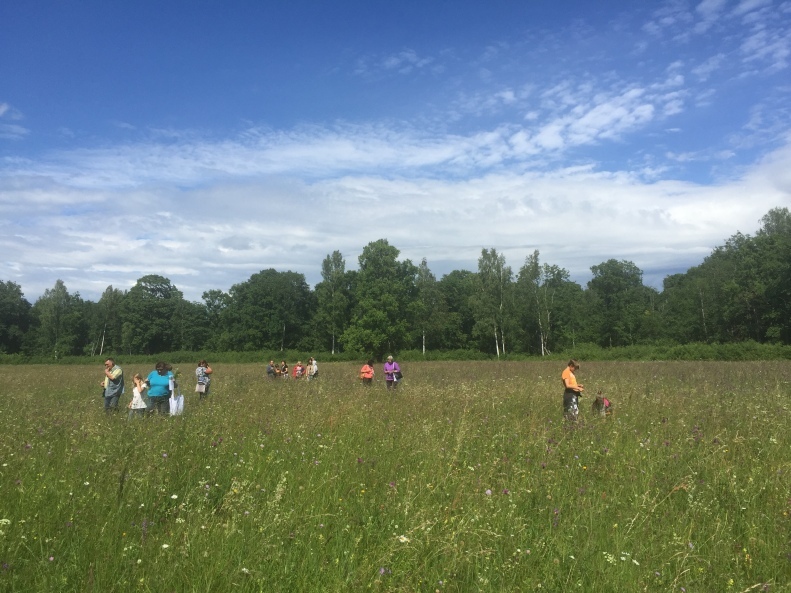 Afterwards participants visited and evaluated sowed grasslands near his country house “Vērmeles”, Semi – natural dry grasslands and scrubland facies on calcareous substrates, Molinia meadows on calcareous, peaty or clayey-silt-laden soils and Fennoscandian wooded meadows near country house “Straumes”, Fennoscandian lowland species-rich dry to mesic grasslands in property “Jaunlazdiņas” and potential EU habitat Fennoscandian wooded meadows near Vērene manor. Every participant identified the most preferred grassland ecosystem services, got acquainted with characteristic and rare species. Dana Prižavoite also told a bit on historical aspects of semi-natural grasslands and their maintenance.